Last night the Hard Rock Cafe Honolulu held their Grand Opening private party for several hundred VIP guests. The Hard Rock Cafe has been operating in Honolulu since 1987, and recently moved to a brand new location on Beachwalk Avenue in Waikiki. 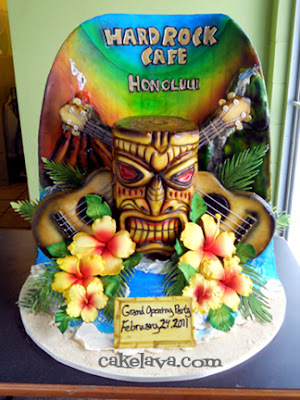 cakelava was hired by Hard Rock Cafe to make a rockin' Hawaiian themed cake for their Grand Opening party. We knew at the time that it was important to focus on the Hawaiian location aspect and also incorporate their guitar, which is a Hard Rock signature piece. Rick designed a giant Hawaiian tiki on a beach with a pair of guitars and an island scene with volcano and waterfall backdrop. 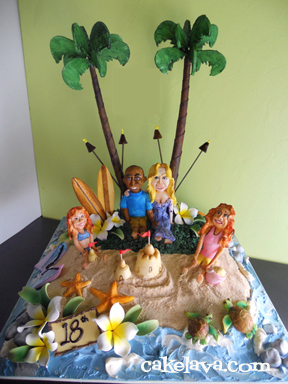 The prominent Tiki, guitars and beach scene was all servable, filled cake in our signature Guava Lava flavor. While working on the cake our kitchen looked like an art studio, there was color everywhere! Rick and I and a couple of our friends attended the party as guests. The new location is absolutely gorgeous -- two floors and the decor is amazing! It is the nicest looking Hard Rock Cafe we have ever seen and our friends also agreed. It would be a perfect place for us to have a drink or take our out of town guests to, and the Beachwalk location can't be beat. We were very impressed! The Hard Rock went all out for this party! We were greeted by the staff and given a lei and immediately offered a Mai Tai or beer. We went upstairs and found a table, and the tray passed appetizers started and they kept coming throughout the night. We had to cut them off, which wasn't easy because everything looked good. There was a large dessert bar, fruit and cheese display and ribs and chicken, oh and an OPEN bar, which meant the night was going to get Really Fun, Really Fast! In addition to the dessert bar was the cake, which was admired by the guests for most of the night and later served. The entertainment started around 8:00pm and we were treated to some of Hawaii's most famous performers. It was an awesome party and we were honored to do the cake for their Grand Opening! Congratulations to the Hard Rock Cafe Honolulu. We wish you many successful years at your new location!! February has been an Amazing month for cakes, and it's not over yet! We have quite the collection of new cakes to share on the blog and we will be showcasing some of our favorites in the weeks to come. The cake above was made for Grace and Jonathan's wedding, which took place last Sunday at the beautiful JW Marriott Ihilani resort in Ko Olina. 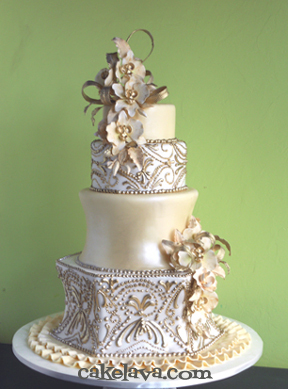 Working with the couple's stylish inspiration board which included the colors of champagne, ivory and gold, phalaenopsis orchids, and an ornate lace and beaded wedding gown, Rick designed a gorgeous wedding cake that was sure to wow the couple and their guests. The bride had requested to include some ribbon detail dimensionally on the cake, which Rick added near the bunches of phalaenopsis orchids. She had also wanted each tier to be different, either in shape or pattern and 3 flavors for her cake, Strawberries Chantilly, Chai Latte and Totally Turtle. We were extremely happy with the cake and hope the couple loved it as well. Congratulations, Grace and Jonathan! We were honored to be asked by the family, who are regular clients of ours, to make a cake that would celebrate the couple's 18 year wedding anniversary. It was important to them that the cake represent the union of the couple and their two beautiful daughters. 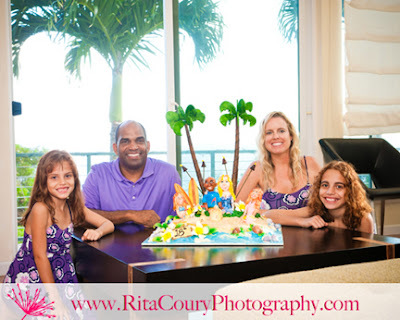 The idea of including the family was truly touching to us and Rick set out to design a cake that would represent one of their favorite activities of going to the beach. He has made similar designs that had a tropical beach setting with handcrafted custom figures enjoying an activity on the island, and it worked perfectly for our clients' needs. The family chose our popular Guava Lava cake for their celebration. Rick spent many hours carefully sculpting the custom figures modelled in the likeness of each member of the family, and making the surfboards, palm trees, turtles and other tropical accents. He placed Hawaiian plumeria flowers on the cake and a sign that said "18th" to honor the 18 years of marriage of the couple. Photographer Rita Coury of Rita Coury Photography, took the beautiful photo above of the family who was all smiles with their cake. They have been clients of ours for a number of years and Rita really captured the warmth and cheerful personalities of the family as we know them. We want to thank the family and Rita for sharing with us their photos. Check out Rita's website to see the gorgeous images in her portfolio! More cakes to come next week! On Sunday, we were transported to a Wonderful, Magical world and we didn't have to hop on a plane to experience it! The occasion was Joslen's first birthday party at Lanikuhonua, with 200-250 family members and friends there to honor a sweet little girl! 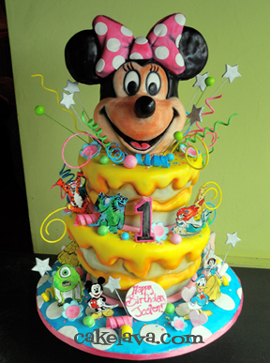 They requested a show stopper of a cake that would tie together their "Wonderful World" theme and emphasize Minnie Mouse. They loved Rick's Dr. Seuss themed design and wanted a cake with a similar feel with a giant sculpted piece and wonky tiers. Rick had carte blanche from the couple to make whatever he wanted to, and he was inspired by the theme and bright, fun colors and set out to give Joslen and her parents a cake that would be unforgettable and talked about long after the party was over. Rick sculpted the Minnie head and the entire cake out of our Guava cake, a delicious, tropical fruity, pink colored cake. All the character pieces on the cake were also made by hand. The cake was gigantic in size and had an even larger presence, which caused the guests mouths to drop when we delivered the cake. The parents were ecstatic with their cake and it looked right at home in their themed environment. We want to thank our couple for bringing us such a fun theme to work with and for making us part of Joslen's big day!